New training technique: goat slaughters??? I’ve often said that the most exciting times of my life are marked by the blank pages in my journal… And I think the same holds true for my blog. Since my last entry, I have been to Kenya, China, and I’m now writing from the Gambia… I have many entries to catch up on, but why not start with the place I’m in right now? I arrived in the Gambia on Friday evening on one of my trips for work. For those of you who don’t know what I do (or for those of you who have lost track! ), I’m on sabbatical this year from my job as a corporate lawyer in New York and working as a programme lawyer at the Human Rights Institute of the International Bar Association (that’s a mouthful). Although I’m technically based in London, my work often requires me to travel outside of England – so far, to East and West Africa as well as Asia. 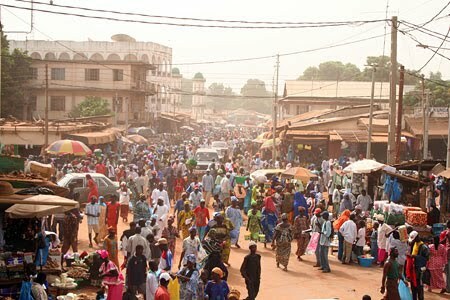 Unfortunately, the Gambia has also attracted the ‘wrong’ kind of tourism. As it turns out, men aren’t the only ones who go on vacation to developing countries for a little…ahem…fun. You wouldn’t believe the number of older British ladies here on their own during the day and miraculously coupled with locals at night. But I’ll stop there in order to keep this G-rated, yes? I’ve been running along the beach here in the mornings or evenings to avoid the hottest part of the day. Other than the slope of the surface, the terrain has been PERFECT for easy running. The hard packed sand has allowed me to run at a relatively normal pace and yet the sponginess character of the sand has been very gentle on my feet/joints. It would be ideal if it weren’t for the local boys trying to sell me beer every few hundred meters (I mean, really, do they expect me to stop my run and chug a Heineken??). Some of them have joined in and run with me, telling me about how they’ve taken over the family business and wondering if they could be my friend (do they think I’m a creepy old British woman or are they vying for a marriage of convenience? I have actually already gotten a couple proposals…). Others have simply cheered me along (ha). Yesterday morning, however, I got a bit of a shock. I was running along a section of the beach where I ‘m guessing tourists don’t go, and I came across a section of fishing boats. I noticed one guy walking up from the water carrying a large carving knife – not uncommon, but still a bit disconcerting given that I was on my own… Crouched down at the water’s edge was a group of men holding a goat that had just been slaughtered. They started to carry it up the beach, which actually motivated me to work in some interval training (good god, get me past the animal remains!!!). On my way back, I had the rare opportunity to witness the goat’s insides being pulled apart and separated into appropriate categories along the sand. Ugh, a little bit of throw up just came up in my mouth. Again, good training for ultras – learn how to run through the nausea, right??? Anyhow, tonight is my last night in the Gambia and I’m off to Liberia tomorrow. More soon! Will add my photos and videos as soon as I can!